King Jesus has gone up on a mountainside and begun teaching His followers how He wants us to live as citizens of His kingdom. His kingdom has already come, because the King has come, and yet His kingdom is still to come because He hasn’t yet brought the kingdom in all of its fullness. So the King is getting His subjects ready for that kingdom and has called us to live as citizens of that kingdom while wait for that kingdom...and while we pray for that kingdom to come. That’s what Jesus’ sermon on the mount is all about. And it makes us uncomfortable. King Jesus threatens our little kingdoms. And He requires us to change. He said that we need to change. We need to repent, to turn around, because His kingdom is near. We’ve said over and over again that the kingdom seems upside-down. But it’s really right-side-up. It’s we who are upside-down. And Jesus is calling us to turn right-side-up. To flourish in His kingdom. And to bring glory to the King. So, first He called us to live the good life. A life of flourishing but not like we might expect. He invited us to be needy, sad, lowly, unsatisfied, and even persecuted. And if we did that for Jesus, we would flourish. We would be blessed. And then He asked us to be salt and light, having an influence on the world even if it meant trouble for us. And then He asked us to live out a greater righteousness than the scribes and the Pharisees. And that was a challenge! The Messiah has come to fulfill the Law and to call all of His followers to live out a righteousness that surpasses that of the religious leaders of the day. Really, to become perfect or whole. The same on the inside as the outside. Because the scribes and the Pharisees looked good on the outside, but they were a total mess on the inside. And Jesus wants His kingdom to not just be a right-side-up kingdom but an inside-out kingdom. And both inside and outside kingdom. Where the two truly match. And He gave many examples. Six of them were the “But I Tell You’s” of chapter 5. Where Jesus took statements from the Torah that had often been misunderstood and misapplied and showed how He wanted them to go right to the heart and to be lived out to the fullest. And then in chapter 6, He gave us three examples of not living out our righteousness “to be seen by” others. Instead, to live out our greater righteousness “in secret,” that is, for the Lord’s approval alone. Not from the outside to get applause from people. But from the heart to be rewarded by our Father in heaven. Verse 4, verse 15, and verse 18. So today’s passage flows right out of that. There is no break big break between verse 18 and verse 19. In fact, our passage for today forms a perfect conclusion to what Jesus has been saying and then a perfect bridge into what comes after it. And He calls His followers to make some big decisions about their treasures. Decisions that He’s still asking us to make today. Here’s our title for today. 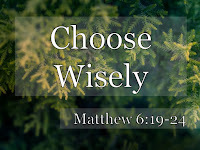 Because in verses 19 through 24, King Jesus lays out some kingdom priorities for what He calls our “treasures.” And He asks us to make some wise choices about what our priorities will be. Last weekend, my sons and I were at the Father/Son Retreat at Miracle Mountain Ranch. We had a great time with those folks up there. They asked me to teach on digging for wisdom in the Proverbs. The very same thing I’m planning to do here at our Family Bible Week this Summer. In the Wisdom Literature of the Bible, there are often two pathways that are laid out before us. The way of the wise and the way of the fool. And these two paths are presented as the only two options. The smart and right way to go, the way of the wise. And the foolish and wrong way to go, the way of the fool. And the choice is set before the undecided to choose which path they will take. Well, I believe that Jesus is being a Wisdom Teacher here in this section of the Sermon the Mount. He sets up three major contrasts in verses 19 through 24 and lays before his listeners their two choices. And He calls them (and us) to choose. Because the question is hanging in the air there. But I didn’t because, at the same time, Jesus makes it very clear which path He is calling us to take. I see three major choices here to make wisely. And by that, I mean your storehouse. The place where you put your possessions. Choose where you will place your treasures. You can’t literally send your treasures to heaven. UPS does not deliver there. FEDEX doesn’t go that far. And don’t even think about asking the Post Office! But I think we all know what He’s talking about. He’s talking about our priorities. He’s talking about our decisions, our choices. Especially of what we do with our treasures. And in the context, that must include our money and possessions. It’s probably more than that. It’s anything we tend to treasure. But it’s not less than that. So it probably includes our time and our relationships and other things that we tend to hold dear. But it certainly also includes our money and our stuff. Now, He’s not saying that we can’t have a bank account. He’s not saying that we can’t have a retirement account. He’s not saying that we cannot own a barn. The Bible is clear that saving money for the future is a wise and prudent thing to do. Productive and saving ants are smarter than human sluggards! 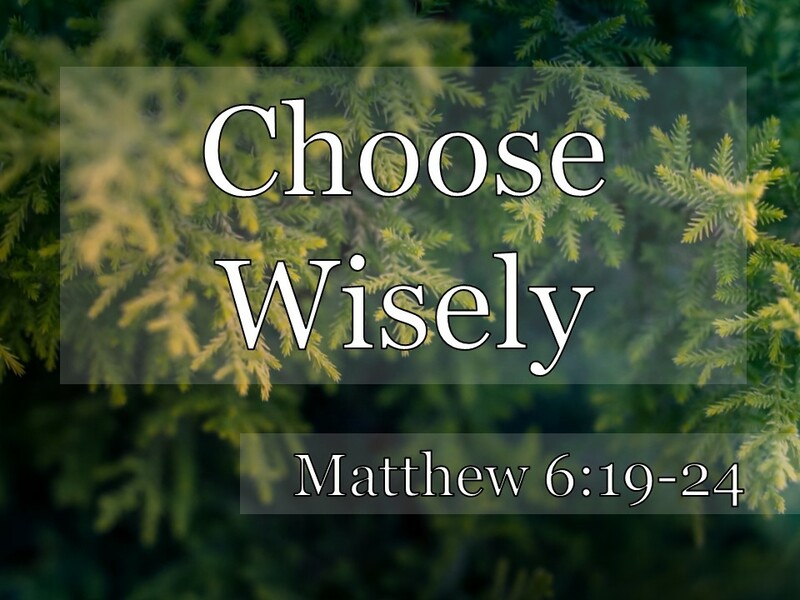 But Jesus is calling us to make wise choices about this stuff. He’s asking us what that money and stuff is doing. And what kingdom is it serving? Because our tendency is to hoard. To get greedy. To build bigger and bigger barns and to put our faith and trust in our money and our possessions. To spend it all on us. And to skimp on the Kingdom. Do you feel the contrast He’s setting up? There is First Bank of Earth and First Bank of Heaven. Where should we be making our deposits? Well, Jesus points out how temporary First Bank of Earth is. Moths will eat up your cloths. Rust will eat up your metals. The word for “rust” there in the NIV is literally, “eating.” The “eating” will destroy your treasures. That includes rats getting in your grain. It’s pretty foolish to be investing all of your resources in something to transient, something shaky. The stock exchange of heaven will never go down. You will never “lose your shirt” if you invest in the Kingdom. Now is this how it seems? No. It seems like the here and now is very real and here to stay. And heaven seems so far away and unreal. But it’s actually the opposite. This life is so short and so flimsy. If you had a million dollars and you invested it in yourself and your little kingdom. How are you going to feel about that million dollars 15 minutes after you die? How are you going to feel about it? How are you going to feel about it 15 million years after you die? Jesus is saying that His kingdom is forever. Which kingdom do you want to invest in? Because get this: verse 21. Where do you want your heart to be? Here on earth or there in heaven? I think Jesus means more than just what treasure is what you set your heart on. That’s just obvious. I think that Jesus means that our hearts, our spirits, the worshipping center of our souls will be where we put our treasure. So this applies to what we saw last time about fasting and prayer. If you make a big deal about your fasting and your praying so that people will see you do it and think you’re so great, then you are investing in the First Bank of Earth. You’re investing in your kingdom. And that’s all that fasting and prayer will accomplish. And the same thing is also true of giving your money. Are you spending and saving it and hoarding and building up your pile for your kingdom? Even giving it strategically to get the applause of others? That’s as far as it goes. You’ve got your reward. Or are you giving it for the kingdom? To the church, to missions, to those in need, to the poor? Jesus is calling us to live with eternity’s values in view. To live and give for what is eternal and forever. Now, this is a tough one to interpret, but the contrast is very clear. We don’t talk like this about our eyes or our bodies. And we know that He’s really using them as metaphors for spiritual realities. I think that means that your insides get light through your eyes so you know where to go. It’s kind of like saying that they are windows. They are the source of the light for the inside of the house which is your body. So it’s very important that your eyes are healthy. If they aren’t healthy, then you will be blind and unable to find your way. But he’s not really talking about eyes and bodies, is He? Just like He wasn’t talking about a beating heart in verse 21. This is figurative language and word play. And I think the key is to understand the word behind “good” in verse 22 or “healthy” if you have the 2011 NIV or the ESV. If you have that kind of “spiritual eye,” and eye on focused on the kingdom, then your whole life will be full of spiritual light. But, contrastly (v.23), if you are eyes are “bad” or “evil” or distracted, focused on the wrong things, then your whole life will be full of spiritual darkness. That just makes sense right? What do you have your eye on? Is it a new car? Is it a new and bigger house? Is it a new and bigger hard drive? Is it a new and snazzier, whatever? Or is it the Kingdom that has come and is coming? Let your focus be centered on Jesus and His Kingdom. That’s what He’s going to say in verse 33. Not whether or not you can read an eye-chart. Do you feel how important this is? If you don’t have this kind of spiritual sight, you will run off course. Last one. It’s really saying the very same thing. Now, here He’s clearly talking about money. He even kind of personifies money. Which is just the Aramaic word for money or stuff. But Matthew doesn’t translate it into Greek like the rest of Jesus’ words, so he’s probably acting like Money has a mind of its own. The 1984 NIV capitalizes it to bring that across. Almost like Mamon is the name of a god. Which it certainly could be. And it definitely acts like one at times for us. Do you catch the contrast? It’s “God vs. Money.” Step right up and see the fight! Jesus says there is no middle way. You can’t have two ultimate Bosses. You can’t have two ultimate owners. Because at some point, and probably soon and often, they will conflict. And only one of them can be the trust Master. You either love God or your love money. Remember, Jesus wants us to be whole. He doesn’t want us to give lip service to loving God but really love our money. He wants all of us. So, how are you doing at this? Really, all three of these are different ways of saying the same thing, aren’t they? Where is your treasure going? Who really is your Master? Just real quickly, do an audit. If you were on trial for being a follower of Jesus Christ, a citizen of His kingdom. What would your checkbook say? Would it be evidence to convict you of being a citizen of Jesus’ kingdom or would it tell a different story? I can’t tell you how much and what to give. Or where to put your money. But I can ask the question, where is your money going? Are you generous and caring for others and it’s obvious from your bank account? Or are you stingy and miserly and greedy and hoarding it all? We can all think of someone who loves money. But the question is, do we love money? Don’t look at anyone else. Look at you. Where is your treasure and where is your heart going? Some of you will feel convicted and you’re not supposed to. You just have tender consciences. Some of you should feel convicted and you don’t. Don’t explain this away. Don’t give yourself an easy out. Think about the people Jesus was talking to. They had so little compared to us! And Jesus was saying this to them! How are you doing in this area of your life? Some of you are, I’m sure, amazing. We have a very generous church here. Thank you to everyone who has given to the Challenge Group’s fundraising. That’s coming together very nicely, and as one of the parents and one of the chaperones and your pastor, I am very grateful. Thank you for giving just to the church general fund week in and week out. I get paid from that money, and I am incredibly grateful for you. And thank you for giving to missions. To the spread of the gospel around the world! And thank you for giving to the needy. People with needs. But I’m guessing that some of us need to be asking ourselves if we are building our own kingdoms or Jesus’. Here’s good diagnostic question for you to tell if you still have some work to do in this area of serving Money instead of God. Are you worrying about money? Because that’s where Jesus goes with it, doesn’t He? That’s where we’re going to start next week. [Matt's Messages] "But I Tell You (3)"